Are you ready to book or discuss the marquee of your choice? on the Pricing Page and we'll get back to you ASAP. We enjoy a good conversation, so please try calling again soon! Please note that it is likely that on Monday and Friday mornings in the summer we shall be out and about setting up or collecting our marquees. If it is urgent, try the mobile, although it may not be convenient or possible to go into detail without any office files to hand! Otherwise, please email us! "We had a small white marquee for our wedding and it was lovely, all decorated, and it made our day!" “I hired two marquees, tables and chairs. Erection was on time and expertly undertaken despite strong winds. Dismantling was again on time and efficiently completed. I would strongly recommend this company to anyone wanting these types of products at an affordable price”. 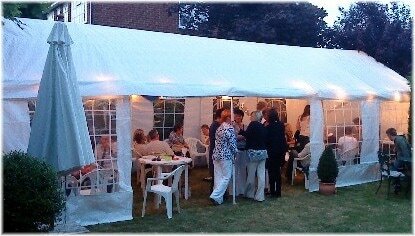 “I have used Budget Marquees on two occasions so they must be doing something right! They provided a friendly and efficient service. All went according to the agreed plan. I shall certainly use again when required and would recommend them to others”. Below you will find contact details of some other suppliers who may be of particular interest to you whilst in the early planning stage of your party or event. We have some recent experience of their products and services and would be pleased to discuss their merits if you ask us. Feel free to 'Click' through to their website or to contact them direct, but please tell them you found them here. Ronaldo Ices - Why not order an ice-cream barrow for your event? Refrigeration, Flowers, Cakes, Balloons, Desserts, Portable loos, table-cloths, dance floors, DJs, Entertainment, fire prevention, pub venues, hotel garden, signage, bunting, feather flags, banners ... Please ask!